I am a learner by nature. When I discover something new, I want to know all about it. I find history and literature fascinating. I will read and research things until I feel like I really understand them. Then, because I am also a communicator by nature, I want to tell everyone what I have learned! I see this desire to learn in my boys. They devour books about their favorite animals. They are curious about how everything works. Daily I am asked to look up things they are wondering about on my phone! In the past few years, I have rediscovered my love for studying the Bible. I’ve made more time to dive in to my study bible and commentaries. I look at maps and original languages and it all makes the Bible come alive for me. I want my boys to use their love for learning to fall in love with Bible like I have. We’re starting early with providing them several tools to help pique their curiosity! 1. Study Bible – When our oldest son received his first study bible, I couldn’t tear him away from it for hours. He loved all the notes, diagrams, and other extras that come in a study bible. This is still his favorite bible to use during his bible time. I find him reading intently and sharing new knowledge with me every time he picks it up. Study bibles are great for curious kids because they go above and beyond to help them better understand the Word of God. Keep reading to learn about one of our favorite study bibles! 2. Bible time notebook – Each of our elementary-age boys has his own notebook that is meant only for bible time. We encourage them to write down verses they like or want to memorize in these notebooks. We also ask them to write down questions and prayers so they can share them with us later. They also love to illustrate what they’ve been reading from the bible that day. Notebooks are a wonderful way to help kids process what they are reading in whatever way suits them best. And you can look through them – with their permission – to see what God is speaking to their hearts! 3. 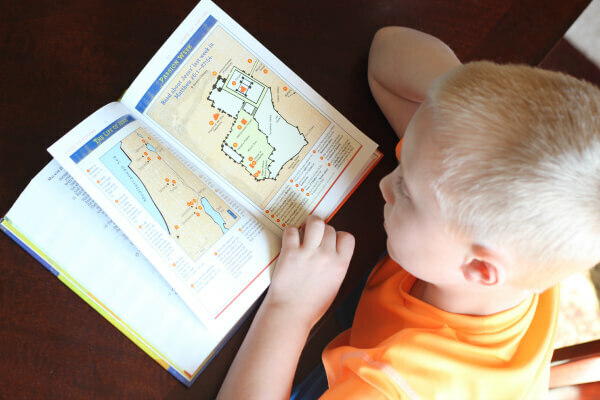 Maps – Many study bibles include maps, but if the bible your child has doesn’t, grab some maps and globe to show them exactly where all the stories they are reading about actually happened. Our boys love finding biblical places and following the routes taken by Jonah and Paul and other biblical figures. This knowledge makes it really fun when new archaeological discoveries are made in those places that date back to the times of Jesus and before. History and geography-loving kids will eat this up! 4. Dictionary – Let’s face it – there are a lot of big words in the bible, even in translations meant for children. If my children don’t know what a word means, it’s hard for them to grasp the true meaning of a bible verse. We keep a children’s dictionary near by for them to refer to, and if the word isn’t in there, we look it up somewhere else together. I’ve learned some new words through this as well! Sometimes, if we have extra time, we will look up what the word would have been in the original language, but that’s just because I love knowing more! The Early Readers Bible is a great resource for many of these tools! Colorful maps, fun quizzes, historical timelines, a dictionary, and much more make this bible perfect for curious young minds. The Early Readers Bible also features large type and a layout ideal for young readers. My boys have been pouring over all the extra information and reading what they are learning since the bible arrived on our doorstep! Providing our children with these study tools is a way to help them discover the bible for themselves. When they can read and look up and search on their own, their faith also becomes more their own. There are days my boys want bible time to go on and on and that’s when I know it’s God – not me – bringing His Word to life right before their very eyes! 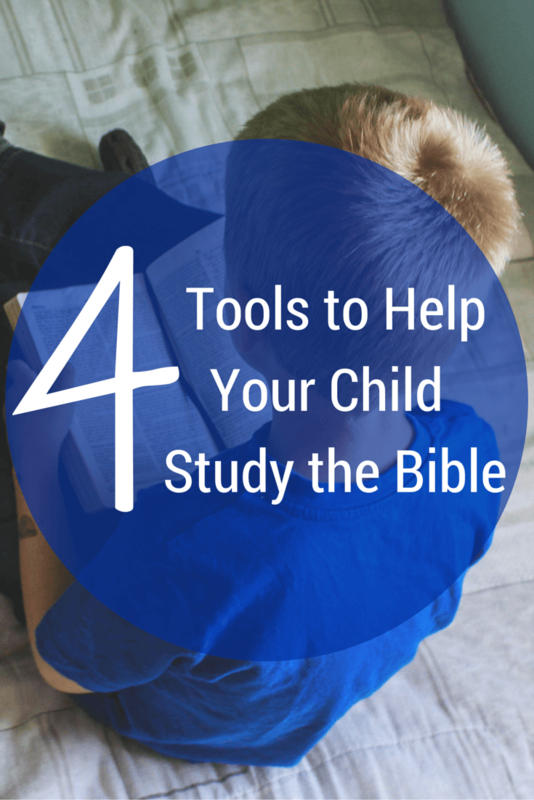 Which tools have been (or would be) most helpful for your children as they read the bible?